Maceo Crenshaw Dailey, Jr., earned his Ph.D. from Howard University. He has taught at Smith College, Brown University, Boston College, Spelman College, Colby College, New York University and Morehouse College. Currently he is associate professor in the Department of History and Director of African American Studies at the University of Texas, El Paso. His publications include (with co-editor Kristine Navarro), Wheresoever My People Chance to Dwell: Oral Interviews with African American Women of El Paso (Baltimore: Black Classic Press, 2000) and (with Ruthe Winegarten) Tuneful Tales (Lubbock: Texas Tech Press, 2002). 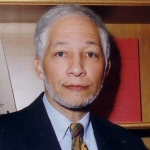 Professor Dailey is a member of the American Historical Association and the Association for the Study of Afro-American Life and History and is a past chair of the Board of Directors of Humanities Texas. He has also served as a commissioner on the Texas Emancipation Juneteenth Cultural and Historical Commission.